A number of studies have compared N Latex FLC and Freelite for monitoring MM . Many report that whilst the two assays show a similar trend in results, differences in absolute values may lead to significant discrepancies in clinical interpretation. For example Lutteri et al. 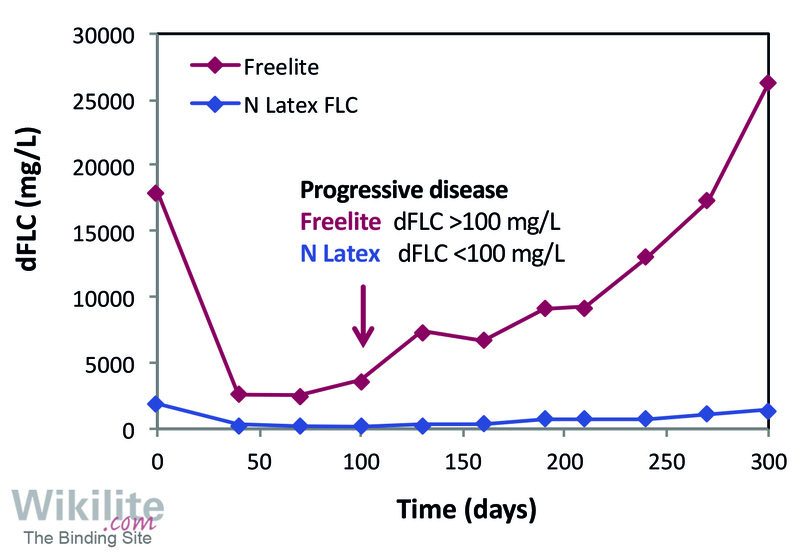 report a case of λ LCMM in which progressive disease was confirmed by Freelite before N Latex FLC (Figure 8.11.). Popat et al. compared Freelite and N Latex FLC assays to monitor 59 MM patients treated with Bortezomib-based regimens. The proportion of patients who had measurable disease was much higher by Freelite than by N Latex FLC assays (64% vs. 37%, n=59), and for the subgroup of patients with measurable disease by both assays (n=20), the agreement in responses assigned using the two tests was only moderate (Weighted Kappa = 0.54). Similar results have been reported by others . Popat et al. reported that during follow-up, Freelite identified clonal disease in 4/61 MM patients when the N Latex FLC ratio had normalised. In each case, clonal disease was confirmed by the presence of a monoclonal protein on serum IFE suggesting that the N Latex FLC assays may lack sensitivity to detect residual disease. Similar results were reported by others . Heaney et al. compared the ability of Freelite and Seralite-FLC to monitor 132 LCMM patients. At presentation, absolute dFLC levels were higher on Freelite than Seralite-FLC (median values: 3207.8 mg/L vs. 657.5mg/L), but at maximum response a similar percentage reduction in dFLC was observed. However, the authors noted a significant difference in assigned response categories: fewer patients achieved a complete response (defined as normalisation of the sFLC ratio) by Freelite (41.7%) than by Seralite-FLC (52.3%). This may reflect insensitivity of the lateral flow-based assay. At disease relapse, the increase in dFLC by Freelite was consistently higher than the increase by Seralite-FLC (median values: 558 mg/L vs. 101.2 mg/L), and the authors proposed a Seralite-FLC cut-off value to define progressive disease (>30 mg/L). This is much lower than the definition in IMWG guidelines, which are based on Freelite values (25% increase in dFLC, provided the absolute increase iFLC >100 mg/L, see Sections 8.7 and 25.3). Jacobs et al. compared Freelite and Sebia FLC assays to monitor four patients with LCMM. Both assays showed a parallel trend in results at all sampling points, but there were substantial differences in the absolute values reported by both FLC assays. A larger study by Caillon et al. compared Freelite and Sebia FLC ELISA results for 47 IIMM and 112 LCMM patients. The two assays did not give analogous response classification, with a clinical concordance of 75% for IIMM and 71% for LCMM samples. Progressive disease classification was concordant in 77% of patients, however, 16 patients (21%) had a dFLC increase ≥100 mg/L by Freelite, but a <100 mg/L increase when measured with Sebia FLC. All but one of the discordant patients met progression criteria by Freelite but not by Sebia FLC ELISA. The authors also noted a “time lag” between detection of relapse by Freelite and detection by Sebia FLC ELISA . In summary, quantitative differences between polyclonal and monoclonal antibody-based FLC assays may lead to significant differences in clinical interpretations when assessing response to treatment and disease relapse . For this reason, the different FLC assays should not be used interchangeably, nor should it be assumed that international guidelines developed with Freelite assays can be applied to N Latex FLC, Seralite-FLC or Sebia FLC ELISA. 8. Jacobs JFM, de Kat Angelino CM, Brouwers H, Croockewit SA, Joosten I, van der Molen RG. Evaluation of a new free light chain ELISA assay: Bringing coherence with electrophoretic methods. Clin Chem Lab Med 2018;56:312-22.